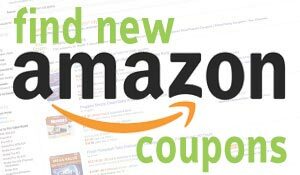 Clorox Toilet Wand Disposable Toilet Cleaning Rainforest Rush Refill, 30 Count Total is now available at Amazon.com for just $11.99 (REG $55.00) (As of 23 March 2019, 19:26 PST – Details) with $43.01 (78%) Savings. 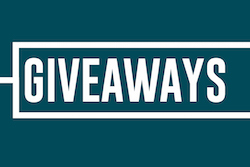 TOILET BOWL CLEANER REFILL: Clean and disinfect with 30 disposable ToiletWand refills in a Rainforest Rush scent that kill 99.9% of bacteria and viruses while leaving your toilet sparkling clean. 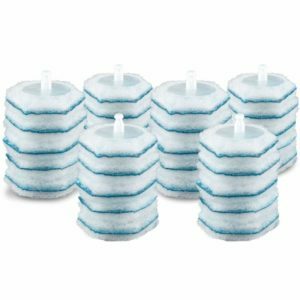 DISPOSABLE SPONGES: The hexagon shaped sponge heads clean in hard to reach places under the bowl rim and drain for a deeper and faster clean. 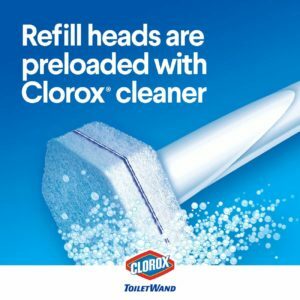 CLOROX CLEANER: These ToiletWand refills with Clorox cleaner create your all-in-one cleaning solution – no need to carry around a bottle of cleaner and germ-ridden toilet brush. 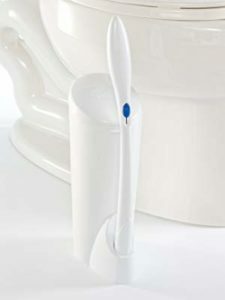 CLICK, SWISH, TOSS: These easy to use refill heads click onto the ToiletWand to swish, scrub and clean the toilet bowl and conveniently pop off to throw in the trash. 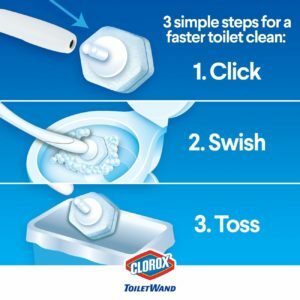 The Clorox ToiletWand Disposable Toilet Cleaning System makes it easy to clean and disinfect your toilet. 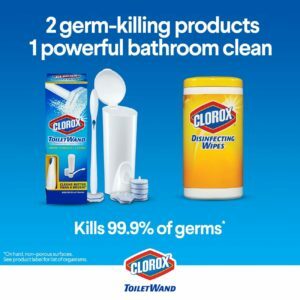 Each disposable cleaning head contains powerful Clorox foaming cleaner that fights stains and kills 99.9 percent of germs* in your toilet bowl, including the germs that cause colds and flus, and can reduce the spread of illness-causing bacteria on and in your toilet bowl. *Salmonella enterica. 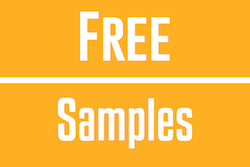 Staphylococcus aureus, Influenza A, Human Coronavirus, Rhinovirus Type 37, Escherichia coli0157:H7. To Clean: Open pouch of disposable cleaning heads and push handle straight down onto cleaning head unit until it clicks into place. Flush bowl before cleaning. Dip cleaning head in toilet bowl water for 1 to 2 seconds. 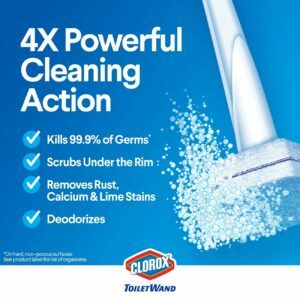 Scrub entire toilet bowl above water line. When finished, to release excess water, press cleaning head against the toilet bowl and slide blue button forward to release head into trash bin. Flush to rinse toilet. Do not flush cleaning head. 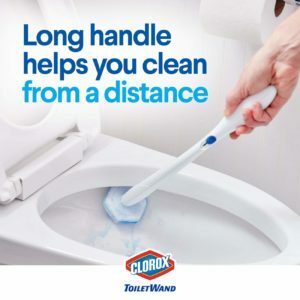 Slide Clorox ToiletWand handle into the caddy for easy storage. To Disinfect: For toilet bowl only. Empty toilet bowl before cleaning. 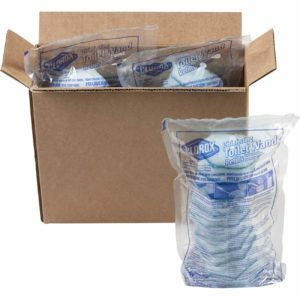 Open pouch of disposable cleaning heads and push handle straight down onto cleaning head unit until it clicks into place. 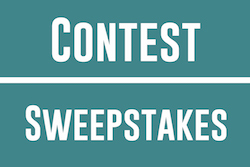 Dip cleaning head in remaining toilet bowl water for 1 to 2 seconds. Scrub entire toilet bowl above the water line. Let sit for 10 minutes. Flush to rinse toilet. When finished, to release excess water, press cleaning head against the toilet bowl and slide blue button forward to release head into trash bin. Next article87% Off on Lush Decor Sealife Reversible 2 Piece Blue Quilt Bedding Set.